A few years ago I shared The Soulmate Secret with my friend Greg Reid. He’s a really successful, busy guy and while he was fully committed to manifesting the love of his life, he didn’t have time to do every single step of the process. So, he decided to do one thing in a really BIG way. Greg created his treasure map, his vision of love, on an entire wall of his office so that he would spend many of his waking hours surrounded by images of the love future he was co-creating with the Universe. Every time he gazed upon his treasure map he would allow himself to feel how happy he was to know, in very cell of his body, that she was already in his life. He didn’t yet know her name, but he knew she would soon arrive. Within a few months, he met his soulmate, Allyn. Brian and I danced at their seaside wedding at the Birch Aquarium here in La Jolla. 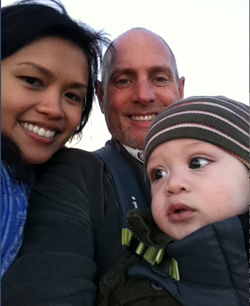 Today they are the proud and loving parents of their one-year-old son, Colt. What is the ONE thing you can begin to do (or even re-do) that will have you re-commit to manifesting the love of your life? As you already know, manifesting your heart’s desire requires a little time, energy, intention and attention on your goals. You don’t need to do this alone. I can want to help you and be your guide and cheerleader on this journey. Please check out my upcoming Soulmate Secret 7 Week Interactive Online Course here. Single men and women, who have read my book The Soulmate Secret, and are actively seeking to manifest the love of their life, often ask me if I can share with them the secret to speeding up the process. They tell me they are tired of waiting, wishing, hoping and yearning for the day the One will arrive. While I know and believe that we can consciously manifest the love of our life into our lives (I’ve done it as have thousands of my students around the world) we don’t get to choose the speed at which it all comes together. I believe that “savoring the waiting” is an important part of the process….this is where we get to really enjoy our last days of being single, a time where we can relish the journey and joyfully anticipate our soulmates arrival. You can now choose to adopt a wabi sabi perspective to your final days as a “single”rather than choosing to succumb to weeks or months of simply “enduring” the wait. Think of it this way: when the seeds of a flower have been planted in the ground and the first leaves begin to sprout, the gardener does not tug on the leaves every day to make the plant grow fast. He trusts that Mother Nature will play her role and then when the time is right, the flower will blossom. Like a gardener, you have planted a seed and invited love to unfold in your life. The best part of practicing wabi sabi is that it will become infinitely beneficial once you are with your beloved. I call this the practice of Wabi Sabi Love. Why would you take the time to learn how to apply Wabi Sabi Love to your relationship? Because 50% percent of first marriages, 67% of second marriages and 74% of third marriages all end in divorce! We aren’t born with the innate knowledge of how to “do” relationship. Even worse, we’ve been brainwashed by modern day society to look for and seek perfection, which leads to an ongoing state of frustration and dissatisfaction. By learning and practicing Wabi Sabi Love you begin to accept the flaws, imperfections, and limitations – as well as the gifts and blessings – that form your shared history as a couple. Acceptance and its counterpart, understanding, are crucial to achieving relationship harmony. It’s is sacred love, the highest form of love, and like most things worth striving for in life requires patience, commitment, personal responsibility, and practice. Imagine how great you will feel when you know your partner loves all of you, all the time? The good, the bad, and everything in between! My soulmate of fourteen years, Brian, and I credit the success of our relationship to applying Wabi Sabi Love to everyday life. If you want to have more love, fun, harmony, and passion while on your way to your soul mate relationship, I encourage you to order this book today (http://thewabisabibook.com). There are several terrific free bonuses that come with it including audio workshops from John Gray, Harville Hendrix, Alison Armstrong and more! I completed writing my eighth book and I’m feeling a mixture of elation and fulfillment while I am also present to a sense of ease and grace. I began the process one year ago with the writing of the book proposal. At that time I knew the title and I had a broad idea of what the book would be about but I didn’t have any confidence that I could actually write it. 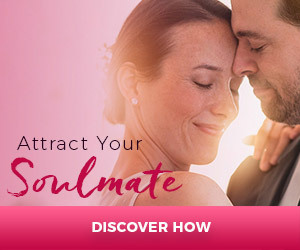 Writing The Soulmate Secret: Manifest the Love of Your Life with the Law of Attraction was rather effortless because it only required that I remember the sequence and details of the steps I took to manifest Brian. All of the material already existed in my memory and in my product www.soulmatekit.com. I was about to tackle a subject that had never been written about before and I would need to reveal deeply personal things about my relationship with Brian to make the book authentic and believable. Yikes! The book, entitled Wabi Sabi Love: Finding Perfect Love in Imperfect Relationships, reveals that Wabi Sabi is an ancient Japanese art form that finds beauty and perfection in imperfection. Wabi Sabi Love is the art and practice of loving the imperfections in ourselves and in our partner. It is not mere acceptance or denial of the things that may annoy us or even drive us crazy but rather a deep and profound appreciation for the uniqueness of each other. What do I need to do to manifest a beautiful book that will be coded with love and wisdom? A book that offers encouragement to couples? My inner guidance gave me this answer: Find a way to believe you were born to write this book and create a support team to help you. And that is exactly what I did. I went online to do some research on Wabi Sabi which led me to an article on the subject by Robin Rice www.bewhoyouare.com , who I then immediately contacted. It turned out that not only is Robin well versed in Wabi Sabi, she has a soulmate relationship and she is a coach! Within a few sessions I was well on my way to knowing and believing I was meant to write this book. Next I enrolled my husband Brian to be one of my editors on the book and asked my brilliant sister Debbie to provide guidance. Brian then reminded me that my friend, author Christine Hohlbaum, also in a soulmate marriage, www.christine.presskit247.com would be a perfect freelance editor to work with and thus my support team took shape. Early on I decided to write 500 words a day, 5 days a week. Usually I write in the early evening after dinner and on the weekends. I also put a sign on my desk with the name of the book and these words “Let It Be Easy”. Each day when I sat down to write I would do a short feelingization and then ask myself, what is the next step? Sometimes I would pick up the phone and call a friend and tell them what I was writing about and ask if they knew anyone with a great marriage that I could contact for a possible “Wabi Sabi Story”, or, I would Google a particular word or person and generally whatever was “next” would make itself known. 1) Have clarity in your intention. 2) Believe and trust you can achieve it. What step can you take today to begin make one of your dreams come true? People often ask me if Brian was working on manifesting his soulmate when he met me and the simple answer is no. Meeting someone new was the last thing on his mind, in fact, when we met he was in the midst of ending a relationship. Krista, a divorcee, bought The Soulmate Secret in January 2009, just days after it was published. Soon after she contacted me via Facebook when she told me she actually met someone while standing in line at the bookstore to pay for the book. It turned out that the man she met was not her future soulmate but I remember thinking at the time that this is a woman who is absolutely going to manifest her soulmate. I told her to be sure to stay in touch and keep me posted. The other day Krista reconnected to tell me that eight months after doing all the exercises, working through the forgiveness processes, journaling about her ideal soulmate, she has found the ONE and they are now planning a life together. “The day Krista and I met, I had just ended a 21 year marriage. After a long drawn out process to save the marriage, it was finally clear we couldn’t make it work. I was out looking for a new place to live when I stopped into a local Anthropologie store (www.anthropologie.com). Walking around dazed, as if underwater, and feeling fairly numb, my heart was in a deep freeze. I remember I was admiring a table in the store. As a writer I knew that I would need to create a workspace for my new place, and this particular table appealed to me. As I stood there with a notebook under my arm, this woman asked me if I was a designer. I turned around and saw this pretty woman and we began what became an animated conversation. I shared with her that I was looking for a new place to live and she readily offered me some local real estate information. It quickly became clear that we had a lot in common but neither of us was thinking that it would turn into anything more than a friendship. I will say that I felt an instant bond with her. I followed up and sent her a thank you email and one thing led to another and soon we were spending a lot of time getting to know each other. The more time we spent together the more apparent it became that we had something special… we really relate to each other on a deep level. I soon realized I had never met anyone that touches me the way she does.